For the Great Competition of Weavers - January 2018 edition - we were asked to design a warp based on the theme Change. I decided to embrace change as a design principle, hoping to demonstrate through the project the transformative effects of incremental change. At nearly every step in design and production, I have introduced a small change. In the warp fiber selection, change was introduced through the use of two slightly different yarns. The difference in fiber content produced a difference in color saturation, resulting in a subtle distinction between the two in both value and sheen. In the warp design, the colors shift from violet through blue to green incrementally - producing a gradual change from one color to it's near opposite. The two warp yarns were dyed together and beamed together then threaded in an advancing parallel sequence. This required carefully alternating each yarn, placing it in the proper place within it's separate sequence, which advanced by one shaft after every 5 ends. 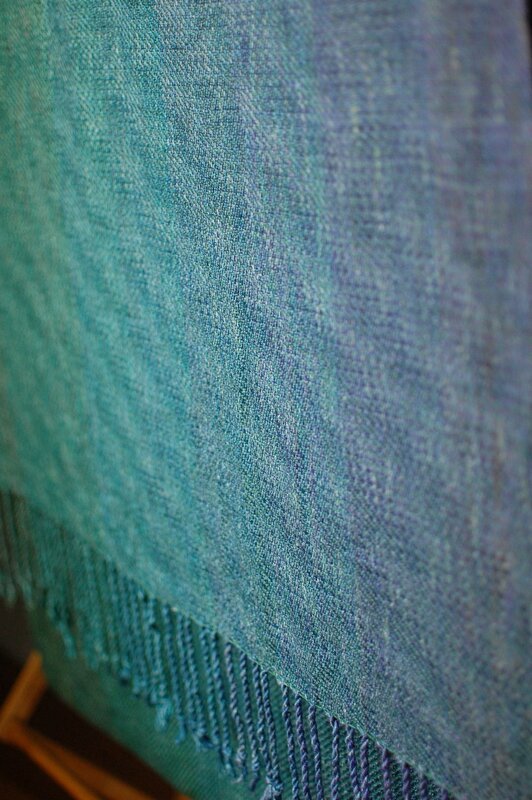 Working in Fiberworks, I developed a weave structure that would allow each of the two yarns to alternate being in the foreground and background. 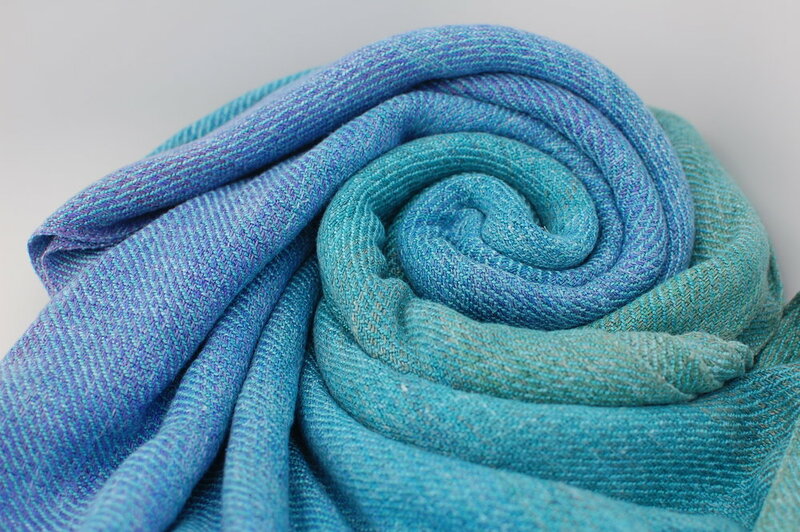 The slight difference in value and sheen achieved through dyeing the two yarns together results in a subtle undulating pattern, resembling ripples across a body water. The weft is the single unifying element, with varying shades of the similar colors to provide a little depth but not overly variegated to ensure continuity. 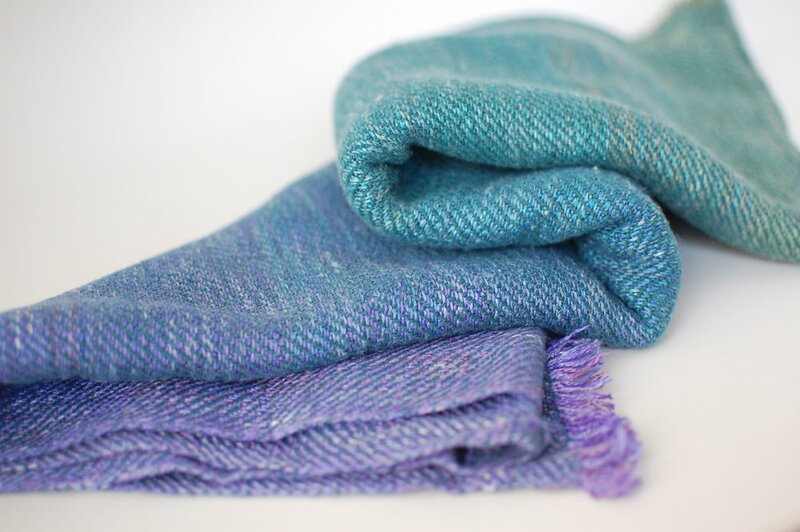 The two wraps I have created are finished with a hand-sewn hem stitch and twisted fringe, which allows the true colors of the warp to be revealed, distinct from the weft. There is also a 2 meter shawl with machine-sewn zig-zag stitching and short fringe. 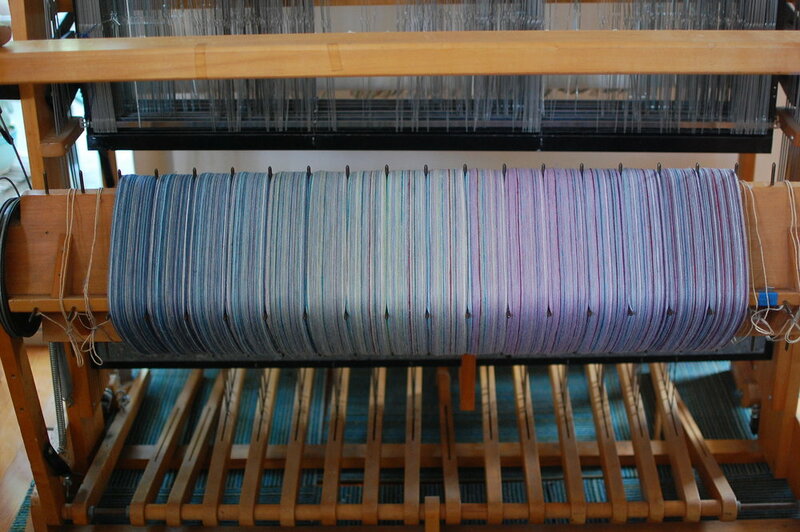 The warp began as 1 kilo of natural silk yarn and 1 kilo of natural 65% silk/35% linen yarn. Two skeins - one silk and one silk/linen - were dyed together. While identical in color, I expected some variation in value as the dyes and process chosen were suited for the primary fiber - silk. I anticipated that the linen, rather than being dyed, may end up merely tinted through the process. The dye table - all set up for work. In selecting which dyes to use, I wanted to maximize the light-fastness and color-fastness of the silk. This would enable me to wash clean all dye molecules that had not bonded with the linen fiber. I didn't want any of the weak dye bonds that can result when dyeing with particular acid dyes to make it difficult to determine when the linen was actually clean. It's a lot of effort to go through to then inadvertently remove much of the dye you've just placed on your silk. This much I know. I chose Sabraset dyes for this project, which are designed to permanently dye protein fibers like silk. Starting with a limited palette of the pure, manufactured Sabraset dyes required me to mix colors to achieve the specific hues that I had in mind. (Toward this end, I found the book Color in Spinning by Deb Menz to be an invaluable resource.) But mixing my own colors also ensured harmony between adjacent sections as colors next to one another were formed with different percentages of the same base dyes. The two skeins were laid out on my dye table and painted with four colors, two of which would be used on the next two skeins. The next two skeins would be a combination of these two colors plus an additional two which moved the scheme further along the color wheel. In this way, I proceeded to dye 10 pairs of skeins in a color scheme that changed incrementally. Here are all the skeins drying. ...and ready to warp. It's always a surprise how the yarn looks once it's wound into cakes. 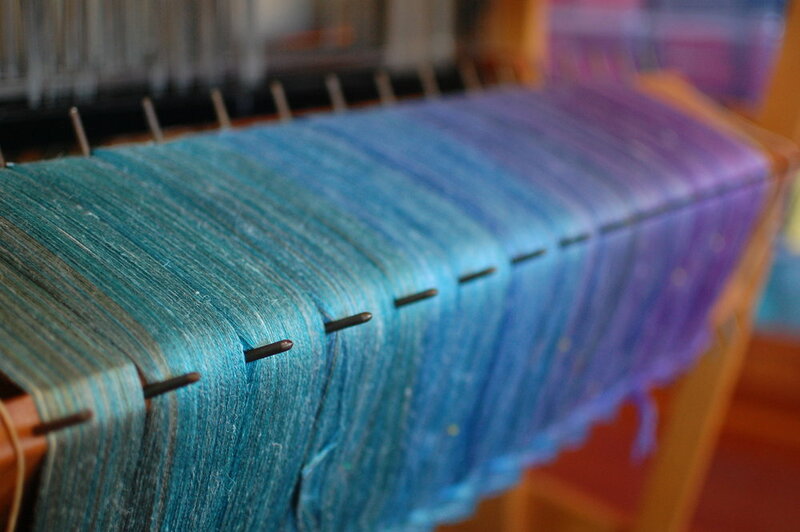 In skeins, you perceive the separate colors more easily. As a cake, and in a warp, the optical mixing of colors comes into play, melding the separate colors into a single hue. Here you may be able to tell that the linen yarn (the cakes on top) are ever so slightly lighter than the silk below. The silk is also distinguished by a higher degree of sheen. The two yarns were about to be paired and warped together. They wouldn't be distinguished from one another again until the weave structure set them apart. At least that's what I hoped at this point in the process! You can see the pairs here on the warping square in this section of dark violet. My favorite part is always seeing the warp colors come together. 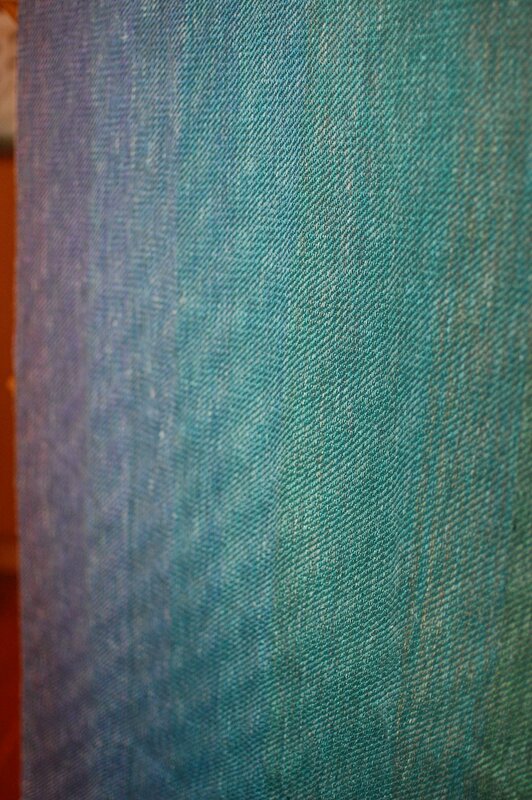 Here you can see the bits of un-dyed linen quite clearly, as well as the transition of color across the width of the warp. I developed a weave structure with a parallel threading to incorporate the two warp yarns individually and allow them to alternate being in the the foreground and background of the resulting pattern. The principle of incremental change was applied while threading the loom as each yarn was carefully selected and placed properly in it's separate, advancing sequence. It was a relief each time I completed threading the 80 ends that were part of one complete sequence. I did this 12 times for the 960 ends required for the warp. Threading the loom took extra care. Not only did I need to ensure that the sequence of the two parallel advancing repeats was correct, but I had to distinguish between the silk and the silk/linen yarns to make sure they were incorporated into the correct sequence. Weaving was equally challenging, requiring an advancing treadling pattern. There were many hours of silent weaving but once the sequence became muscle memory, I could go back to listening to podcasts! It was such an incredible relief to me when, about 18" into the first section, the undulating pattern could be discerned in the weave. I love the subtlety in the shift between the two yarns. Combined with the color scheme, it reminds me of ripples of water across a still body of water. 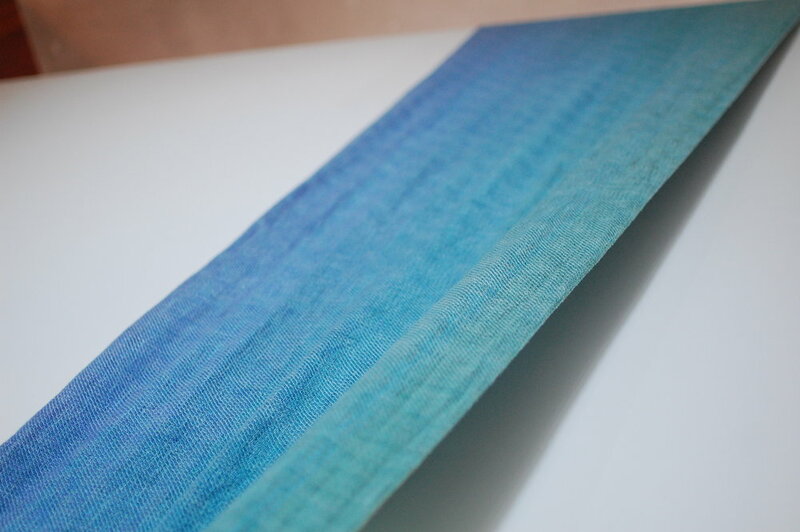 I chose to work with a range of blues for the weft to enhance the aquatic effects of the warp and weave structure. The length of the warp - approximately 18 meters - allowed me to weave 3 pieces. Two of these are 5.1 meter wraps finished with a hand-sewn hem stitch and twisted fringe. The third piece is a 2 meter shawl finished with a machine-sewn zig-zag stitch and 1" fringe. The following photos show the Supima cotton weft wrap. This is the wrap that I entered into the competition. It is 5.1 meters in length (not including the fringe) and approximately 28" wide. 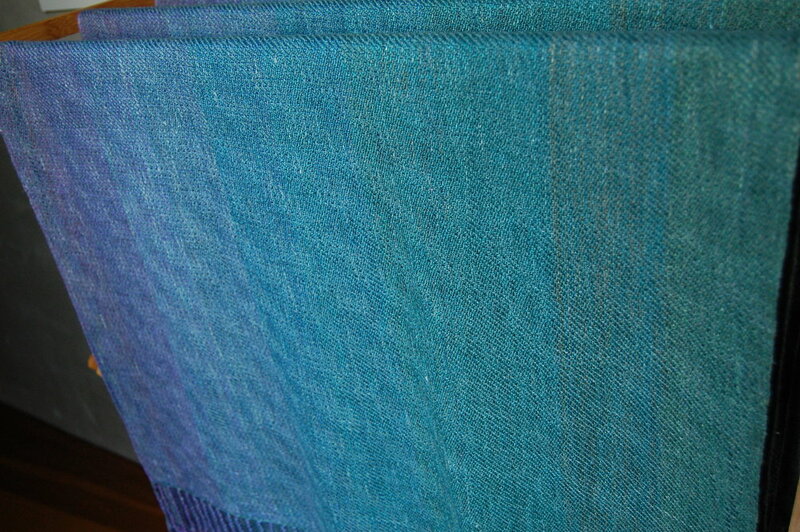 It is woven with a 16/4 Supima cotton weft yarn that I dyed in shades of teal. It weighs approximately 304 grams/m^2. It is extremely soft. It has a lovely drape without being overly thin. I think it would be good for carrying small babies and toddlers alike. The following photos show the Rose weft wrap. It is 5.1 meters in length (not including the fringe) and approximately 26" wide. 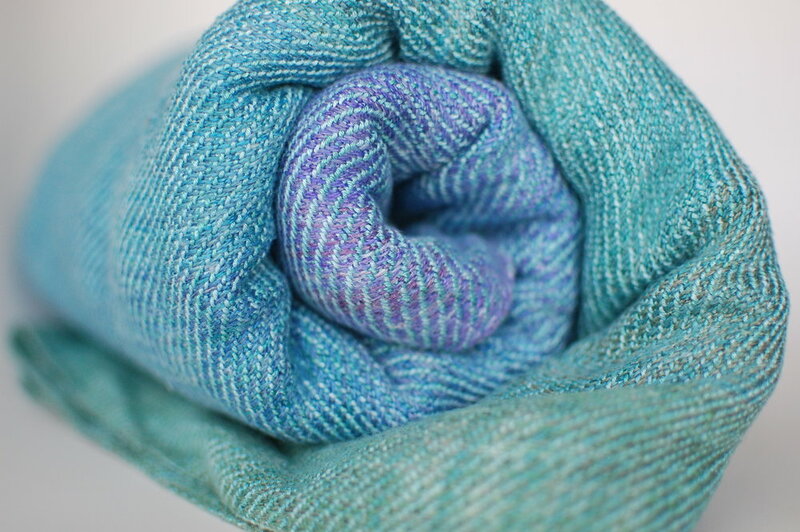 It is woven with a rose yarn that I hand-dyed in shades of turquoise. It weighs approximately 324 grams/m^2. This number is a bit misleading as it is technically more dense than the Supima weft wrap but mysteriously feels lighter in hand. It is extremely soft and has a pleasing squishiness. The thin feel in hand leads me to believe that it would be best for carrying smaller babies. 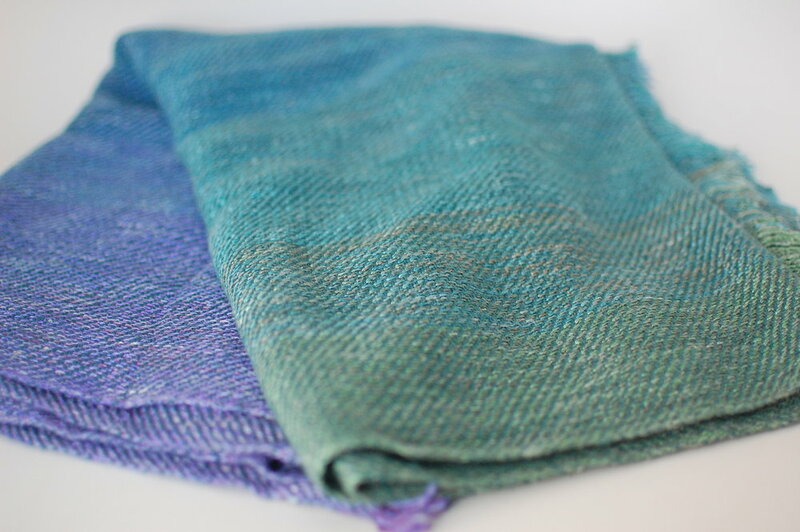 The following photos show the organic cotton weft shawl. It is 2 meters in length (not including the fringe) and approximately 28" wide. It is woven with Venne organic cotton yarn, commercially dyed Peacock. It weighs approximately 310 grams/m^2. The three pieces will be available for sale by draw. I have all the listings ready but tags need to be sewn. I've got a busy week coming up and I want to make sure this gets my full attention. For this reason, I'm keeping the draw open until Friday, January 26th at 12:00 PM Pacific. To enter the drawing, please complete the form below. Entries are limited to one per person and are non-transferrable. I will draw one entry for each wrap on this date. If your entry is selected, I will send you a PayPal invoice. Full payment is required within 24 hours unless other arrangements are made in advance. And now some information regarding the change that is foremost in everyone's minds. As you are undoubtedly aware, the federal safety standards for infant sling carriers approved by the Consumer Product Safety Commission last year go into effect January 30, 2018. I have a sample and am currently preparing to send it for testing. Depending on test results and processing time, I may be on a short hiatus. I plan to spend the time on some very necessary drawings for a small construction project I hope to start this year. 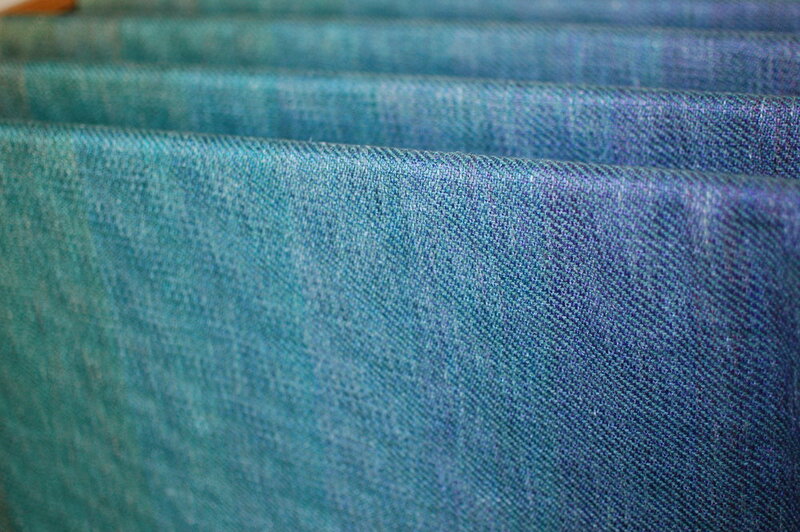 I will be testing a twill weave variation in a silk/sea cell/linen/cotton combination. My plan is to begin by offering wraps with this weave and combinations of fibers in close approximation to the sample submitted. It is difficult to decide on a weave and fiber combination when you've spent years exploring the possibilities. This is one of the reasons I haven't yet submitted my sample. I'm still not 100% sure this is the direction I want to take but I hope to get this nailed down soon! Before the limitations come into effect, I threw on a fast weft-over project on the AVL. I plan to have a couple wraps complete before the deadline. You can read about this in the chatter group on Facebook, wonder woven love. A new project is in the works on the Macomber loom! The warp is 60% cotton/40% linen - my favorite fluffy cottolin from Sweden. I designed this one at the beginning of August - immediately after returning from our week-long camping trip in Sequoia/King's Canyon National Park. I considered naming it "Serenity Now" as that was what I most desired as I emptied all my bins of cottolin yarn cones in search of a tranquil color combination to instill a sense of peace in my studio as we began our last month of summer vacation. But as we've now just returned from a spontaneous road trip up to Oregon to view the total solar eclipse, I thought the term Penumbra might capture quite nicely the spirit of these colors. It is a very lunar colorway - with silvery, muted tones. The design is symmetrical - with silver dominant in the center. It transitions on one side through a greenish-grey to light blue, followed by dark blue and on the other side through iris to a silver-blue and mauve-grey. It features random pinstriping throughout in colors that complement and contrast with the base colors. Following are some photos of the warp. The first photos provide a comprehensive view of the colors and organization. The last offers an artistic view. The warp has been threaded in a straight sequence on shafts 1 through 8. This allows me to play with different weave structures, which may be varied by changing the tie-up and/or treadling. I discovered some fun new weaves this way as I made my way through Obsucra. Ultimately, my goal with this project is to settle on one weave structure and weft fiber that provides the tactile qualities that compliment the characteristics of the warp fibers. I have chosen to begin with a weave I know to have a lovely visual interest in the finished cloth and is not overly dense - it will be both pliable and breathable. Sampling with a variety of weft fibers and structures will allow me to discover the particular combination that yields the fabric characteristics I am after. This will be the weave structure that I will send for ASTM testing to comply with the new federal safety standards for infant sling carriers set to go into effect on January 30, 2018. 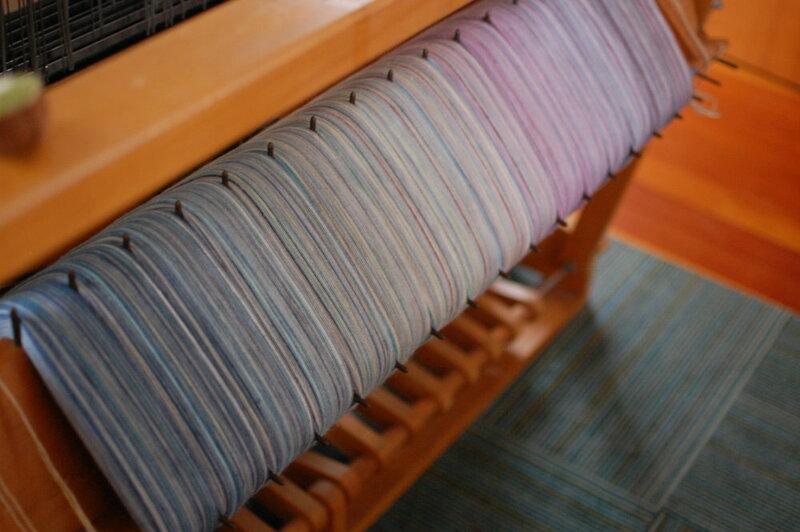 There are 40 yards on the loom to play with, along with a variety of weft fibers. I would love to dye up some yarn that compliments the warp colors, as this one does - a lace weight superwash wool/sllk yarn I dyed in a custom colorway. For a simpler look, there is also the possibility of choosing a solid-color yarn - which will allow the colors of the warp to read with clarity. The following shows the warp with a silver cotton weft. I am happy to work on any variation you can dream up! I have space on the warp to work with 4 people on a custom weft/custom length piece. The price will start at $105/meter and may increase depending on the specification of a premium or custom-dyed yarn. Exact pricing can be found on the following form. I will keep the form open until I have allocated all the warp I have available. A deposit in the amount of 10% of the cost of your piece is due to hold you place. The balance will be due upon completion, which is expected to be by the end of September. This week I have the immense pleasure of attending the ANWG 2017 NW Weavers' Conference in Victoria, BC! I am now 2 days into my 3-day pre-conference workshop on Fiberworks with Margaret Coe and Bob Keates. On Saturday, I will enjoy Stencil Dyeing with Brian Whitehead and round off the weekend learning Tunisian Crochet - something I've wanted to do for at least a year! A very exciting part of the festivities will be the Wrap Weavers Collaboration at ANWG 2017 - which includes a Signature Style Exhibition and retreat. (Well, that is assuming the above activities allow me any time to retreat!) For this exhibition and superlative competition, we were challenged to define and represent our Signature Style. I posed a challenge to the lovely members of my Facebook Chatter Group, Wonder Woven Love, and asked them to submit an image they found to represent a style they could identify as my own. 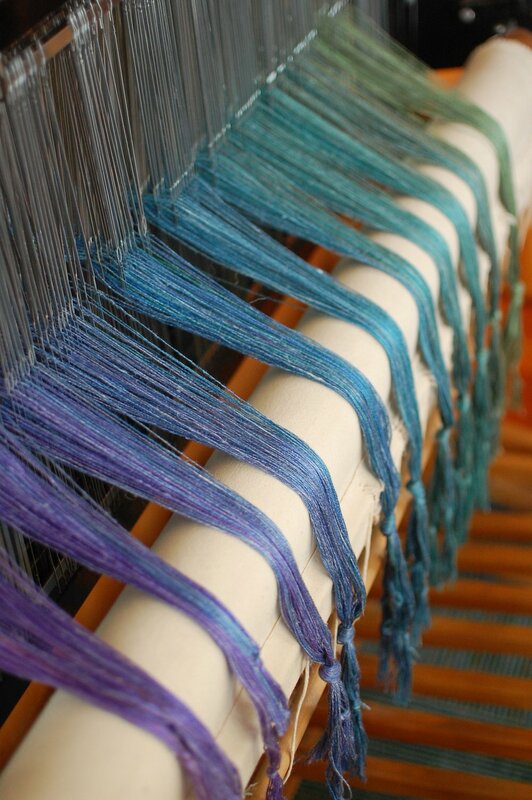 I chose from those submitted three images to use as inspiration for a hand-dyed 100% silk warp. In dyeing the silk, I used a technique that I have been developing to apply the dye in a way that produces subtle shifts in color and tone. Each skein is unique - a variegated yarn with smooth washes of various colors. They are shown below, lined up in the sequence in which they were beamed on the loom. 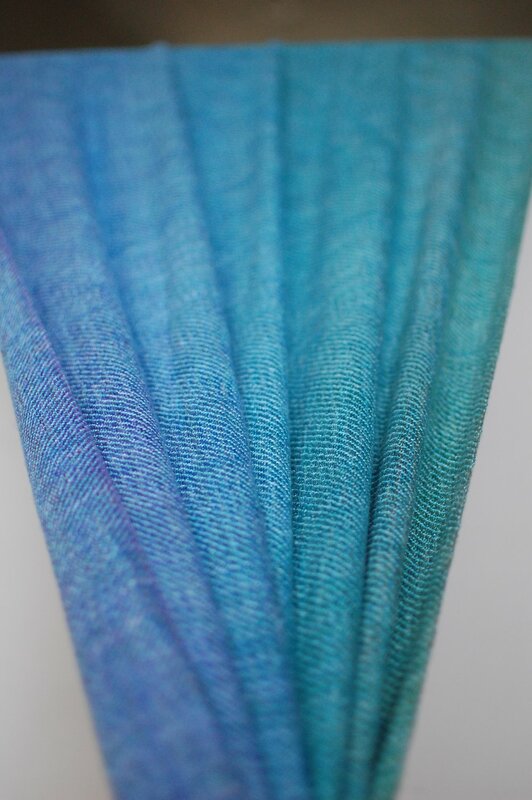 These photos, taken while measuring the warp, show the subtle blending of color. The silk skeins were combined in warping in such a way so as to create a smooth gradation among the colors that harmonize. Where deep purple meets the contrasting color of orange, an abrupt line is created between the two. This organization is meant to evoke the horizon as seen during a sunset over the sea - one of the images that provided inspiration for the warp. The weave I have chosen is a 16-shaft draft from Louis Serrure's Atlas de 4000 Armures (pattern #36232 on handweaving.net). The draft is visually quiet with a delicate diagonal pattern that can be discerned without distracting too much from the play of color of the warp - which I wished to be the dominant feature of the design. The warp is about 20 yards in total - likely enough for 4 wraps. Two have been promised to those who helped select the inspiration images. One is shown below. An additional wrap may be made in the future if the warp provides enough length. The piece I am submitting for the Superlative Competition has an Eggplant Egyptian cotton weft. It measures 4.5 meters in length, 72 centimeters in width and weighs approximately 270 grams/m^2. It is incredibly soft and smooth. This wrap will be on display at our booth in the vendor hall and will be available for purchase by draw following the conference. See below for details on entering to purchase this wrap. Last April, I moved my Macomber loom to the Camera Obscura Art Lab in Santa Monica for a 3-month long Artist in Residence program. When I applied for the residency earlier this year, I had proposed to explore local color through watercolor studies of a nearby park and to translate these studies into a woven fabric while hosting 13 public workshops related to fiber arts. I have 4 weeks remaining - ample time (I hope!) to complete weaving my 40-yard warp and host 4 more workshops. Read on for the story of what I have been doing thus far. As the weaving will soon begin, it is now time to secure your place on the warp if you wish to purchase a piece. There is yardage available, which includes an opportunity to customize your weft and weave! The workspace is unparalleled. Ocean views, a lovely tree nearby that provides ample shade; a room bathed in natural light with ocean breezes. Weaving can sometimes feel like tedious work. But in such a space, it becomes a meditation. I have never enjoyed it more! It is an honor and a privilege to inhabit the space and a great joy to share it. Each week I welcome the opportunity to open it up to others. I have enjoyed discussing the progress of my work as it has taken shape and to engage in a fun side project that draws from some aspect of my work. The public workshops have been so much fun! The Camera Obscura is about a mile from my house. When time allows, I love to ride my bike there. My route takes me through the gorgeous Tongva Park. When my residency began, this is where I would stop to complete watercolor studies to capture the colors of the landscape. A riot of greens - olive through sage to a bright green that sometimes transitions to yellow - burgundy and a subdued blue-green. Spring brought pops of orange and red with plants in bloom. 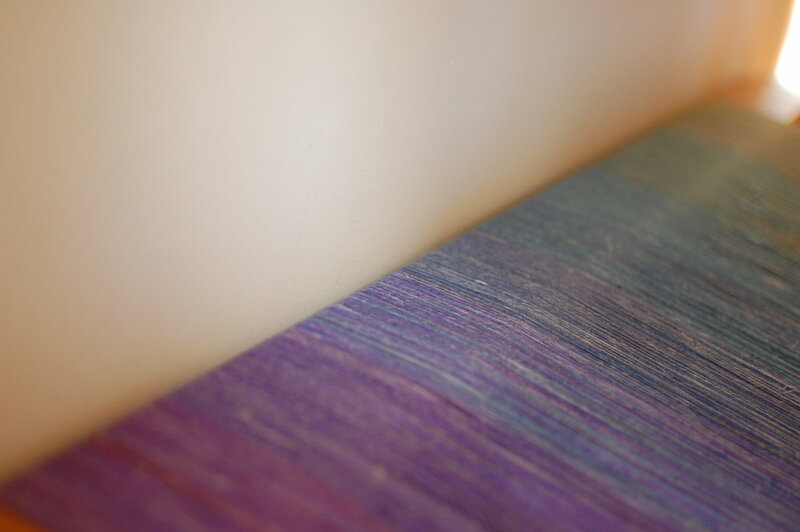 The watercolor studies provided inspiration for a hand-dyed cotton warp. I chose to work with a California-grown organic Pima cotton for this project. The yarn size is 10/2. I spent much of the first five weeks of my residency winding, dyeing, washing and winding again (and sometimes over-dyeing) this yarn. When it was complete, I wound it onto the loom at a density of 30 ends per inch. Across the 32" warp there are 960 ends. 60 ends were wound around the beam in each of 16 sections, having first been wound onto spools and mounted on a spool rack placed behind the loom. In the process of winding, the colors were grouped to create a gradation from the dark greens of the olive grove, though the brightest greens and Agave blues of the planting beds to the muted colors as painted under the dense marine layer of a spring morning. 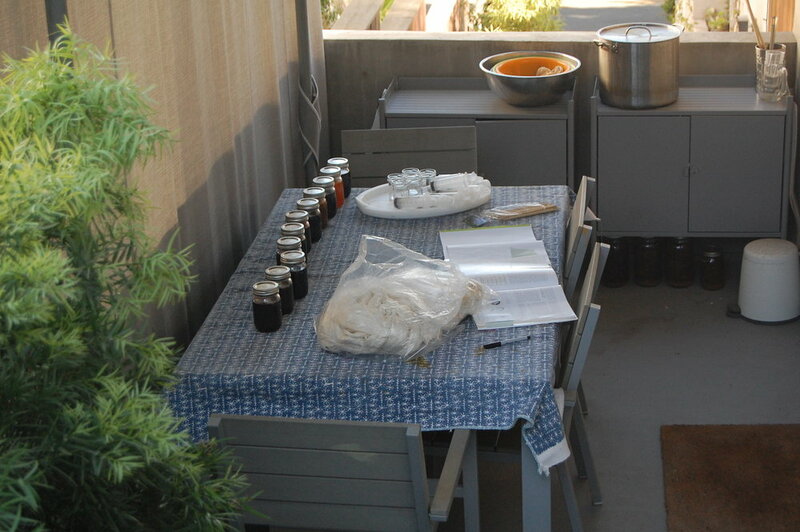 Below are photos of the process. All the yarn wound into cakes - having the space to spread out really helped in this process! One section, as it is wound onto the loom. As the project will be presented at the end of my residency at the Camera Obscura, I chose to sample a number of weaves to demonstrate the effect that different tie-ups and treadling can produce with the same sequence of threading. The differences between drafts are subtle but the results are so unique! I threaded the loom in a straight sequence from shaft 8 to 1, repeating this over the entire width of the warp. I selected a number of drafts that would work with this threading, changing the tie-up after each 20" sample. The drafts were chosen for their dense interlacement from two trusted sources. I have yet to encounter a draft from either of these books that does not create a weave I love. Each draft was new to me. Tie-ing up and weaving a new draft is a bit like finding an unfamiliar sheet of music and playing it to discover the song concealed within the notes. Adding to this process of exploration is the fact that the true nature of the fabric is not apparent until after it is off the loom and wet-finished. This should be clear from the photographs below, which may illustrate the importance of sampling. The weight of the sample piece with each of the following weaves is approximately 270 grams/m^2. This is a dense, flat and moderately smooth weave with a subtle hatched pattern. Of all six samples, this weave is the most dense. It is not overly thick, however, and is nicely moldable. This weave will pair best with a cotton weft. It would make a wonderfully supportive 100% cotton wrap. 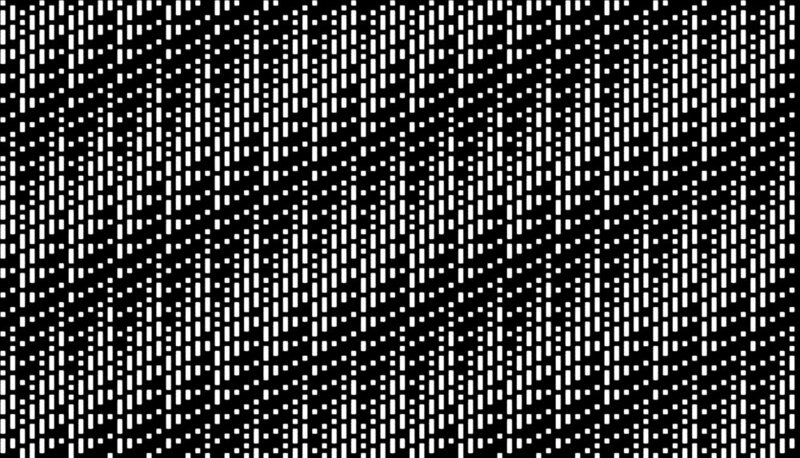 This has a visually uniform pattern with a pleasing texture. It is a light, airy weave. Being more open than the previous weave, this one would benefit from the addition of linen to add support, though 100% cotton would work in longer lengths with multi-layered carries. This is a weave with a distinct front and back and subtle zig-zag motif. It is smooth and relatively flat. It would offer lovely support in any of the weft fibers shown. This is a weave with a distinct front and back and subtle wave motif. It is airy and light and has the most visual interest of the six samples. Being a more open weave, this one would benefit from the addition of linen to add support, though 100% cotton would work in longer lengths with multi-layered carries. It is challenging to weave as it requires all 16 treadles. This is a weave with a pronounced zig-zag motif on one side. I would recommend a weft with linen to add to the support, though 100% cotton would work in longer lengths and multi-layer carries. Featuring a broken sequence in treadling, it requires greater focus to weave this draft. The most textured of the six samples, this weave has a delicately intricate interlacement. The weft samples further down the page were woven with this draft. This would be a lovely weave in any of the weft fibers. In keeping with the concept of demonstrating possibilities with this project - I sampled 33 different weft yarns in a full range of greens and some greenish-blues. The majority of the yarns are cottolin and cotton - commercially dyed - as I have these readily available. Additionally, there are four special fiber wefts I sampled. These are available in smaller quantities and will limit the length I can weave with these wefts. The weft sample piece - wet finished. 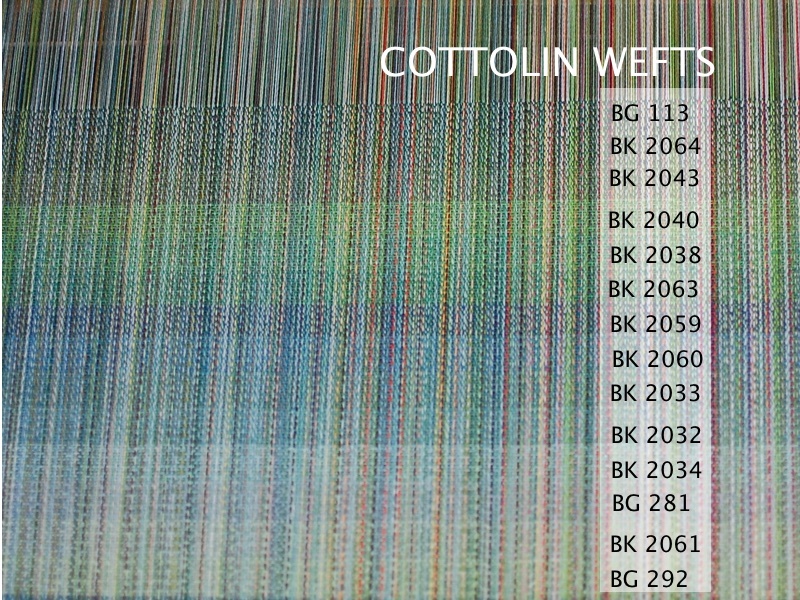 Cottolin colors are shown on the left from light green to dark green; cotton colors are shown in the middle from light green to dark green; special fibers are the 4 wider stripes on the right. Weaving will commence immediately upon my return from the ANWG conference, which I will be attending later this week. I am opening the warp up for 5 semi-custom pieces, available by random draw. The price is $110/meter for any weave or weft shown. If you are interested in purchasing a piece, please complete the form below. I will keep the form available through the evening of Friday, June 30th to give you ample time to consider the options. If you have any questions about which might be most appropriate for you, please do not hesitate to ask me! Entries will initially be randomly selected, but as warp space is allocated, preference will be given to wefts I have in stock or can easily obtain. I have a limited amount of time in which to complete the weaving and I must be sure that I have all the materials needed to do so. The drawing is limited to one entry per person and is non-transferrable. I will be in contact over the weekend with those selected. A non-refundable deposit of 10% of the cost of your wrap is required to hold your space on the warp. The balance will be due upon completion, which is expected to be by the end of July. The newest warp on the countermarche loom is mostly Egyptian cotton - there are some cotton and organic cotton yarns in the mix to broaden the color palette. My spring colorway, it transitions smoothly from deep plum to coral, taking a brief detour through a silver-green that adds some brightness through the center. Complementary and contrasting colors are mixed into each section for a highly pinstriped, very colorful warp. The sett is approximately 24 EPI. It has been threaded with the same 8-shaft crackle draft that was used for Escapade. I would consider this warp to be the cousin of Escapade. I am holding a drawing for semi-custom spots on the warp and will offer as many as the warp length permits. I have approximately 50 meters available - with 4 meters presently claimed. The maximum length per entry is 5.2 meters. Wefts may be selected from those shown below or we can discuss other options you may have in mind. For wefts, I have sampled lace-weight superwash wool and wool/silk blends, plus cottolin, cotton and hemp/cotton in a number of colors. I'm really liking the softer tones with this warp - the silver, greenish-grey and light purple complement the warp colors nicely. 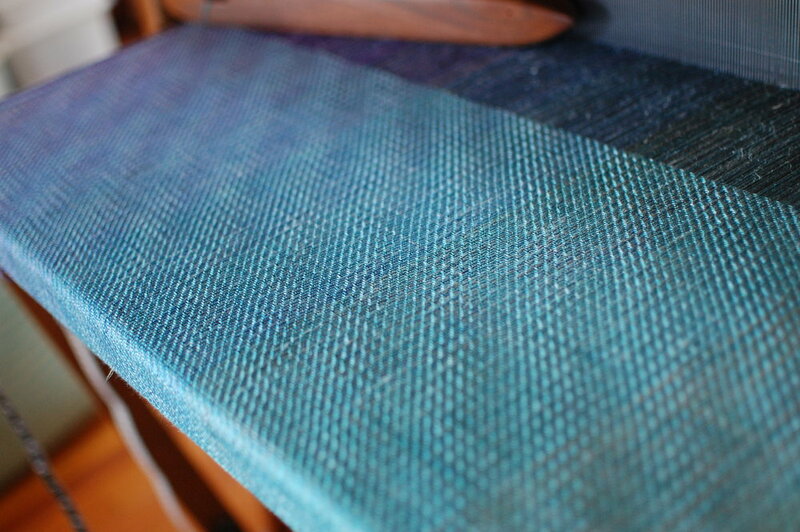 I started off the weft testing with a custom-dyed yarn that I created in shades drawn directly from the warp. This yarn is a deliciously soft and lightweight 75% superwash merino/25% mulberry silk. 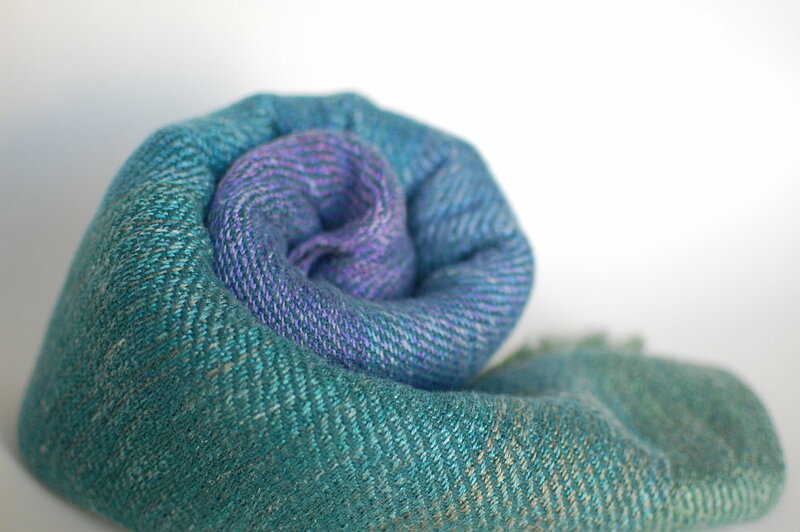 The colorway would also be lovely in superwash wool, silk or silk/linen. I am attempting to reproduce it with fiber reactive dyes on pima cotton...we'll see how that turns out! In addition to the yarn I dyed, I sampled some Phydeaux Designs 80% superfine merino wool/20% silk yarns that pair beautifully with the warp. 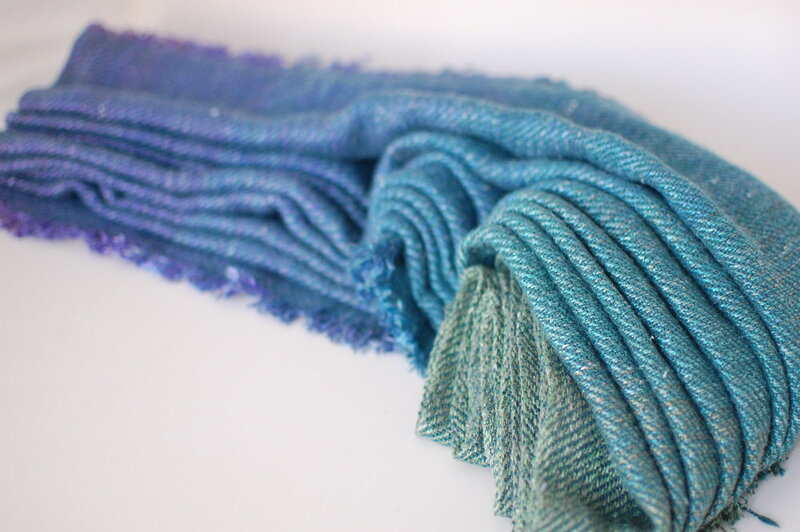 I have very limited yardage in these colorways - think shorty or ring sling piece if you're interested in these wefts. But if there is something you love, we can work on dyeing something custom. These wefts are expected to produce a wrap in the range of 285 grams/m^2. Below are photos with these lovely variegated yarns shown together. From the top: Phydeaux Designs Calypso, followed by Phydeaux Designs Peach Blossoms, Phydeaux Designs Nectar, and finally the superwash merino/silk that I hand-dyed. Next up are the superwash wools. I sampled some that I had on hand that were more tonal variations in color as opposed to variegated - to show the difference in the appearance. The one that I think really captures the spirit of the warp is MadelineTosh's Silver Leaf. It really picks up the hint of green through the center of the colorway. I have many skeins of this one, but the quantities are very limited with the others. These wefts are expected to produce a wrap in the range of 290 grams/m^2. The photo below shows all the superwash wool wefts together. From the top: MadelineTosh Tosh Lace in Silver Leaf and Calligraphy, followed by a superwash wool that I dyed in a variegated colorway, then MadelineTosh Tosh Lace in Stovepipe, MadelineTosh Tosh Lace in Purple Basil, and Phydeaux Designs Pomegranate superwash wool. Next up are the cottolins. I chose these because I love a little bit of linen and they also offer some colors not seen in the cotton yarns. Many of these colors can be reproduced as a custom-dyed yarn in any fiber. From the top and right pirn: greenish grey, silver, silver blue, plum, hibiscus, coral, light melon and light peach organic cottolin. The weights for these will likely be in the range of 330 grams/m^2. Below are two series of cotton samples. The first shows from the top and right pirn: Raspberry Egyptian cotton, red cotton, coral Egyptian cotton, bright coral Egyptian cotton, bright green cotton, light green cotton, teal cotton, greenish grey Egyptian cotton, silver mercerized cotton, silver cotton, natural Egyptian cotton. The second group of cottons. From the bottom and the pirn on the right: deep plum Egyptian cotton, plum cotton, purple Egyptian cotton, periwinkle Egyptian cotton, Orchid egyptian cotton, lavender Egyptian cotton and Burgundy Egyptian cotton. I found a bit of hemp/cotton I had dyed silver that I thought I would try while I was sampling. Here is the result. This will likely end up in the range of 325 grams/m^2. *Natural yarns may be hand-dyed for an additional fee of $75. To enter the drawing, please complete the form below. Drawing is limited to one entry per person - please only enter for yourself. I will randomly select entries on Sunday, March 12 at 9 PM Pacific and will notify winners by email. Wefts that are available in limited quantities will be assigned in the order that entries are selected. I will contact everyone whose entry is selected and - in cases where the weft has already been assigned - give you an opportunity to select an alternate weft. A non-refundable deposit of 10% of the estimated cost of your wrap is due within 24 hours to secure your place on the warp. Special order yarns will require payment for the yarn up front. Full payment for the wrap will be due upon completion - which is estimated to be within 8-10 weeks. Please add more time for special order or hand-dyed yarn.